PUTIN’S POPULARITY. Some Western academics asked “But is his popularity real, or are respondents lying to pollsters?” and concluded “Putin’s approval ratings largely reflect the attitudes of Russian citizens.” I didn’t bother to read their paper because I know – as does any serious observer – the answer already. Of course he’s popular: he is the leader of a team which has achieved a tremendous turnaround in Russia’s situation. Since 2000 all indicators are up. I wish we could say the same in our part of the world. USSR DEBT. With a payment to Bosnia, Moscow has paid off the last of the debt it inherited from the USSR. When an earlier agreement that the 15 would divide the debt fell apart, Moscow took responsibility for all of it in return for USSR assets abroad. It did this despite the fact that its creditors insisted on repayment while many of its debtors could not pay. The total was about USD80 billion and many debts to it were forgiven. I well remember how glad we all were that it took responsibility for the debts as well as the other leftovers: weaponry outside, nuclear weapons and its guarantee of Russian citizenship to any Soviet citizen who wasn’t automatically given citizenship where he lived. It was only later that the last three were rebranded as evidence of imperialistic intentions. VISA RETALIATION. My take: I believe Moscow is ready to follow Washington right down to zero representation is that’s where it goes. But, if the Russiagate bubble bursts (probably the most severe blow is the exposure of the Guccifer 2.0 fake by VIPS) then the original pretext will burst too and things can get back to normal. MAKING WATER RUN UP HILL. Lithuania is getting LNG from the USA and Ukraine coal from the USA. More expensive but supposedly for security. Well, whatever: if they want to pay more, let them. Of course in all likelihood they will “pay” with IMF or EU loans. Payback’s a problem for later. CHANGE OR BLIP? The Prime Minister says Riga is interested in better relations with Moscow and a Polish poll shows number who regard Russia as a threat down about 50% in 3 years. After all, despite years of “Europe faces a ‘real threat’ from Russia” Russia still hasn’t conquered anybody. But that just makes some people shout louder: “The growing Russian military threat in Europe“. TRUMP KEEPS AFGHANISTAN GOING. Reinforcing failure. Trump Vows To Leave A Better Afghanistan For Nation’s Grandchildren To Fight In. The generals rolled him, as they rolled Obama. And if it really was short skirts, then there’s a lot more to that story than he, or McMaster, probably know. Today the Americans get their supplies in via Pakistan or the Central Asian countries (through Russia). Washington has made threatening noises at Pakistan and Russia. How then? CHICKENS, HOME, ROOST. 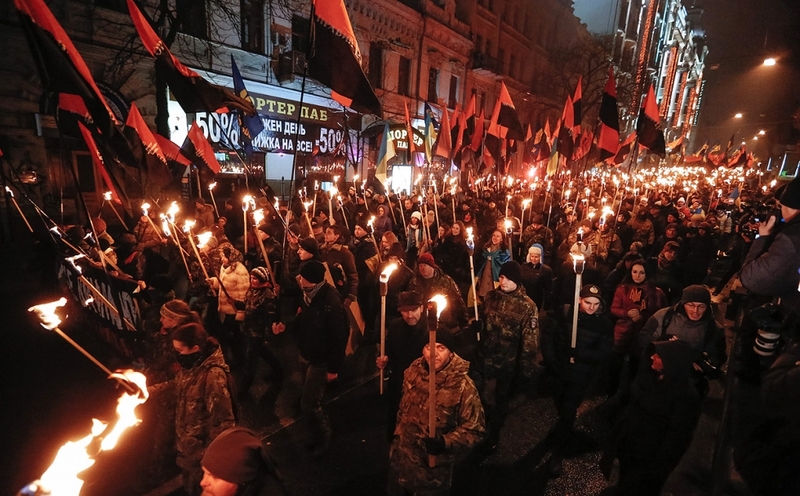 Torchlight parades in Kiev, Riga, Tallinn. 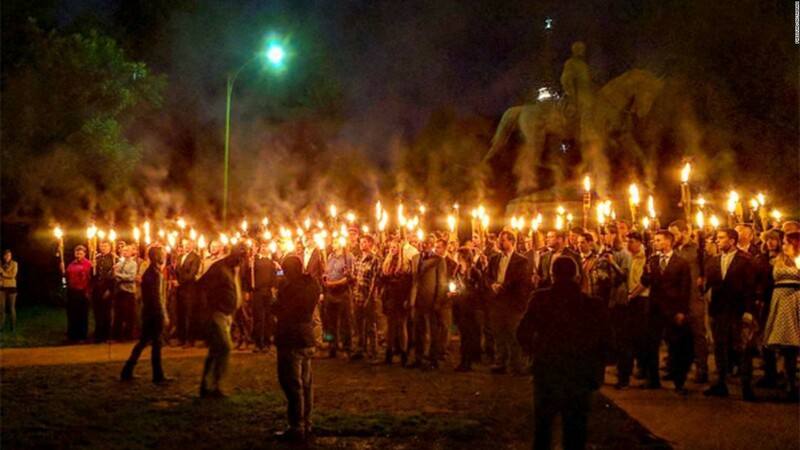 And now Charlottesville. “Nationalists” there, but “Nazis” here. Some historical background for the Ukraine case; Baltics. AMERICA-HYSTERICA. Newsweek discovers a new bottom level. “Charlottesville’s Alt-right Leaders Have a Passion for Vladimir Russian Federation President Putin“. UKAINE. More signposts of disaster. Ukrainians now spend 50% of their income on food; not poverty says the Minister of Social Policy fatuously but because they like to eat well. The Economist rates Kiev among the ten least liveable cities. Did Ukraine supply the rocket motors to North Korea? And, I’ve mentioned this before, but the longest-lasting effect of the Kiev coup may be a nuclear disaster. The cynic would say that, after the reduction, the US has too few staff to spare from plotting Putin’s overthrow to do normal diplomatic duties. Or maybe it’s some half-witted notion that, deprived of a chance to go to Disney World, the Russian population will rise up and overthrow Putin and let the US Navy into Sevastopol at last. It is however somewhat ironic, given the American confidence in the superiority of their own system, that they would want to make it harder for Russians to experience such a superior exemplar of freedom and democracy. My belief is that Russia has realised that, as Putin told Stone, individuals may change but the US system does not. Given Washington’s support for opposition figures, its predilection for interference, its funding of GONGOs hostile to the Russian government, military actions in the neighbourhood, oft-stated declarations of enmity culminating in the latest sanctions, I would expect that Moscow is ready to follow Washington all the way down to zero representation if that’s where it goes. Moscow has less to lose than Washington. One can always hope that a more sensible approach will win out but that hope is ebbing away as Trump makes more and more concessions to the War Party and his “why not make friends with Russia” thoughts are washing away. If — one never wants to completely give up hope — the Russiangate nonsense is blown up thereby destroying the pretext for the original US actions, then maybe we can get back to something normal. SANCTIONS EFFECT. Russian statistics tell us that the share of imports in the retail sector is 36%, the lowest since the 2008 crash. Food imports are down to 24% from 34% in 2014. The percentage of imports in various categories: cereals 0.2%; sausages 1.6%; flour 1.8%; poultry 4.1%; pork 8.3%. Gessen will be glad that cheese imports are 27.7%, but sad that they’re down from 48.4%. Sanctions work: just not the way the US Congress thinks they do. Altogether, it’s probably fair to say that Russia is now self-sufficient in food. And production is only going to become bigger: the potential of Russian agriculture has never been tapped; serfdom, the village mir and collectivisation were not very productive. Conventional opinion has been wrong about Donald Trump every chance it has had. He wasn’t seriously running; he’d never get the nomination; couldn’t possibly win the election; would be impeached, declared insane, would quit, was failing, was a Putin stooge and on and so on. Therefore absolutely nothing in the MSM or conventional thinking about him is worth a millisecond’s consideration: whatever conventional thought thinks is wrong. I know of only one person who has successfully read the Trumpian tea leaves and he is today saying that Trump is on the point of complete victory. Read Scott Adams; don’t waste your time with those who have been wrong every time before. That having been said, I have been reading Adams on Trump for more than a year now and have seen him get it right time after time. If he says Trump is on the verge of victory, I believe him. I waste no time on the opinion of pundits who will be wrong again. I was encouraged by Trump’s oft-stated intention of having better relations with Russia and his statement in his Inauguration Address that “We will seek friendship and goodwill with the nations of the world – but we do so with the understanding that it is the right of all nations to put their own interests first. We do not seek to impose our way of life on anyone…“. For too long Washington’s real message has been the threat, however fragrantly wrapped, “Do what we want or we’ll destroy you”. Twenty years of this has destroyed many countries: it has also (not that the destroyed are sorry about it) weakened the United States itself: Iran’s power and influence has spread, Russia and China are allied, other long-time allies are looking away, the US itself is debt-ridden, quarrelsome and stripped of the manufacturing power that made it so mighty. I believe that Trump understands this on some level. Putin had similar problems when he, an outsider, was dropped into the Moscow swamp and here the Saker advises Trump to emulate Putin. Psychiatry recognizes a condition known as ‘moral idiocy’. Every time he opens his mouth in public, Putin confirms this diagnosis for himself. Putin, of course, is no Peter. The KGB lieutenant colonel who was abruptly bumped into the presidential throne of a nation in total disarray comes nowhere near ‘the Great’ in ambition, potential, drive or physical height.